"Expressive Articulation for Synthetic Music Performances"
They look at Leopold Mozart's book on early classical/baroque articulations, and do some measurements of instruments. So I thought I'd have a stab at a circuit in SPICE. Here is it, in case anyone is interested. 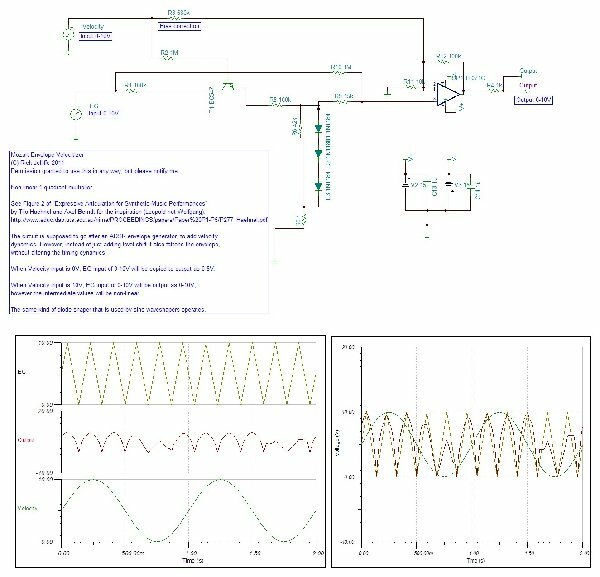 Basically, we run the ADSR through a multiplier and then into the same kind of sine shaper diode circuit that VCOs use. The result is that at low velocity, a linear ADSR input comes out err linear. But at higher velocity, the input is bent into a curved shape, filling out the note without altering the timing. Anyway, attached is the circuit, a sound simulation (synthedit), and an eg waveshape. It's a really simple circuit...would be interesting to hear it built and tested on a synth voice articulating it with something other than veolcity (like a sequencer output). Just to say that Elby Systems now have released this circuit as a kit and built, as Velocitizer, see http://www.elby-designs.com/contents/en-us/p1057_ASM322_-_Velocitizer.html It is a simple build, less than an hour all up: through hole, 4HP and my build worked first time. Interesting article! One of the staples of electronic music experimentation has long been timbral variation which can be created in many different ways. This article provides insights into ways that timbral variations have been achieved by non-electronic musicians. The idea of simulating those techniques without relying on samples/multisamples of non-electronic instruments is intriguing! Thanks for posting the link. Articulation, if not reduced to a mere tone duration feature, offers a big potential for synthetic music performances. OK, so now I have tried it with different diodes: Silicon (1N4148), Germanium (1N60), and Schottky (BAT85) which have progressively lower voltage drops so different responses in this fixed circuit. Works fine with all of them, and each have slightly different feels and output levels, but I cannot really characterize them, or pick a favourite. I think the Schottky gives a sharper attack or something, but I cannot say. I will probably stick with the Germanium, merely because I am tired of unsoldering. It would be neat to have a switch to select between different diode types. I have put up another little audio demo on Muff Wigger Eurorack forum (search Velocitizer), with the Velocitizer pinging a Low Pass Gate. That demo uses the Germanium. The LPG does not get excited by low CV signals, so it works well with the Velocitizer, giving more of a range than a normal VCA does. In this example, you can hear a variety of different note shapes: no knobs were twiddled all the variation is from playing. One effect that is noticeable is that the sustain is set to 50%: from the action of the Velocitizer, it means that low velocity notes have an effective sustain of 25%, while notes played loud have an effective sustain of 75% (very roughly).